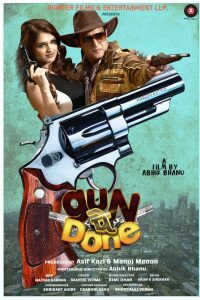 Filmmaker Abhik Bhanu is all geared up with his forthcoming Gun Pe Done, says it is a love story about bootlegging, which is first of its kind in Indian Cinema. Director Abhik Bhanu was interacting with media during a press-junket for Gun Pe Done, which stars an incredible ensemble of Jimmy Shergill, Tara Alisha Berry, Sanjay Mishra, Vijay Raaz and more. Zee Music Company has acquired the music rights of the film and filmmaker Abhik is happy with the association. The film is being produced by Asif Kazi and Manoj Menon under the banner of Pioneer Films and Entertainment LLP. The film also features Bidita Bag, Vrajesh Hirjee, Deepraj Rana and Anant Jog in pivotal roles. The film releases on 12th April 2019. बांदीपोरा हमले में घायल हुए चेतन चीता को अस्पताल से मिली छुट्टी! नोएडा में अगले साल दिसम्बर 2017 में चलेगी मेट्रो- मुलायम!